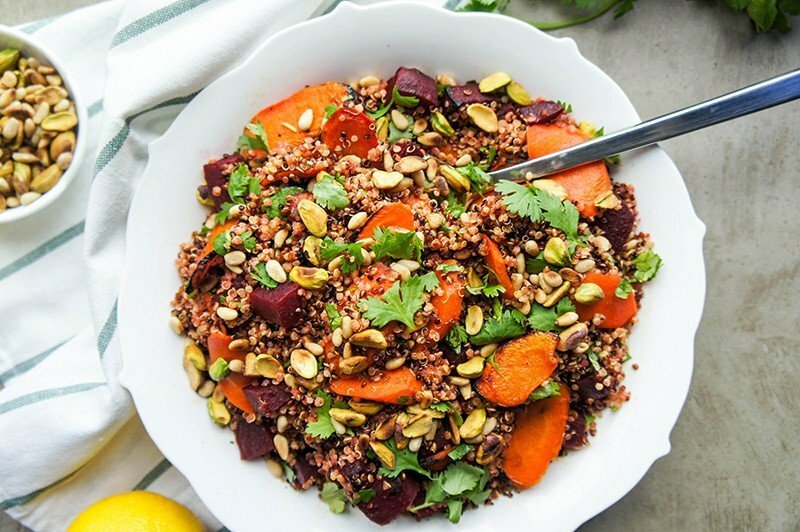 This Roasted Beet and Carrot Quinoa Salad is a great bridge between roasted vegetable season and lemony-herb filled salad season. Talking about lemony-herb filled salad season, is it too early to start counting the days until summer vacation? I was 8-9 months pregnant over my last summer holiday, so I was stuck in Kuala Lumpur instead of getting to visit my family in the States. I am really looking forward to a trip home this summer, and getting to introduce my newest family member to all his relatives in Oregon. It will be so strange to be in the town I grew up in with a new little one in tow. So much fun to get to see him enjoy all the things I did as a kid. Living in Kuala Lumpur is a whole different world to Bend, Oregon, and often feel sad about parts of his childhood that will be different from mine… but we are planning on moving before he is school aged, so that will change. In the meantime, my mom is preparing to introduce him to life in the country. She is searching out plans to make him a fancy sandbox– because what kind of little boy doesn’t play in the dirt? (one that grows up in the city!). And summer in Bend is so different than the year-round heat of Kuala Lumpur. I love the dry heat, and the cool mornings and evenings. It’s heat you look forward to instead of hiding from. When I am back visiting, my mom and I start our days when breakfast on the back patio, then hike/run/walk along the rivers, up the mountain paths, around the lakes, and then end many of our evenings back on the patio BBQing. Ahh, that is heaven. 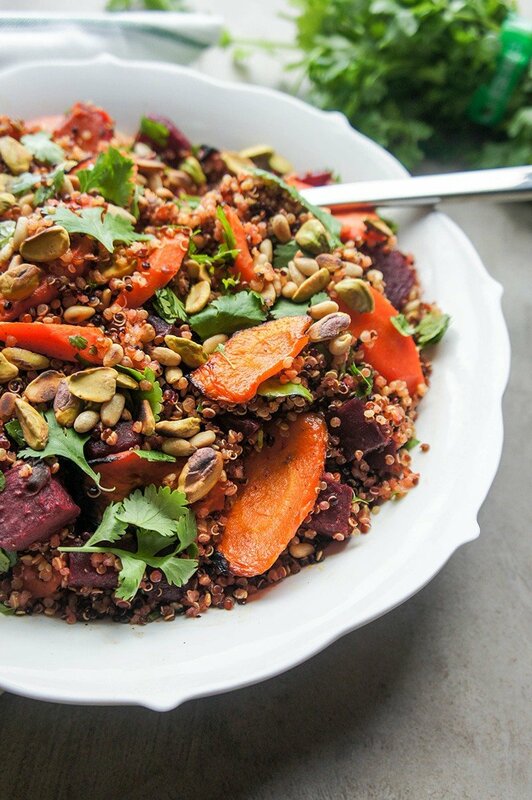 This Roasted Beet and Carrot Quinoa Salad would taste even better on my mom’s back patio. Or along the river as a part of one our picnics. A great addition to grilled meat, and the leftovers make a stand-alone meal on its own. It has great plant proteins from the quinoa and added nuts. 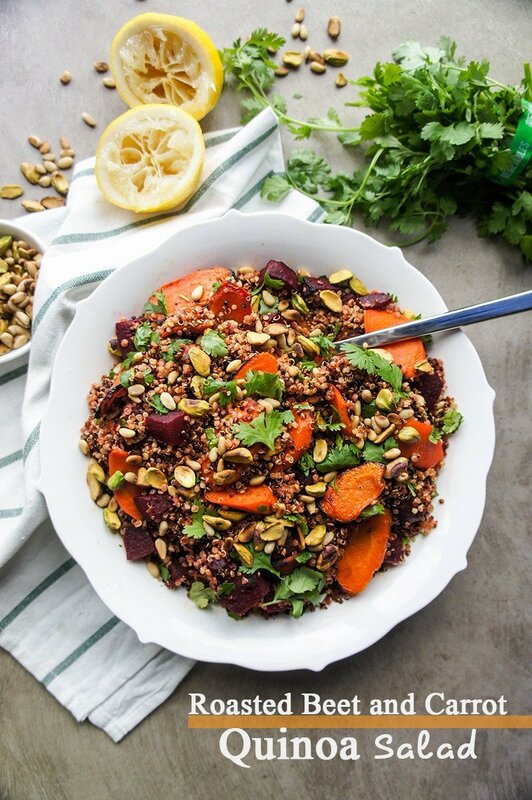 A wonderful blend of roasted veggies and quinoa, with subtle spices and lemon. Cook the quinoa per package directions, and set aside. I take the lid off the quinoa and fluff with a fork after it's finished cooking to keep it from becoming overcooked. On a lined cookie sheet, add the carrots and beets, keeping separate. Drizzle both with olive oil and honey, and sprinkle with salt and pepper. Use a spatula to mix up and coat all of the vegetables. Baked the vegetables for 30 minutes, until the beet root is very soft and the carrots have begun to brown and caramelize. Add all dressing ingredients to a small covered container and shake to mix well. 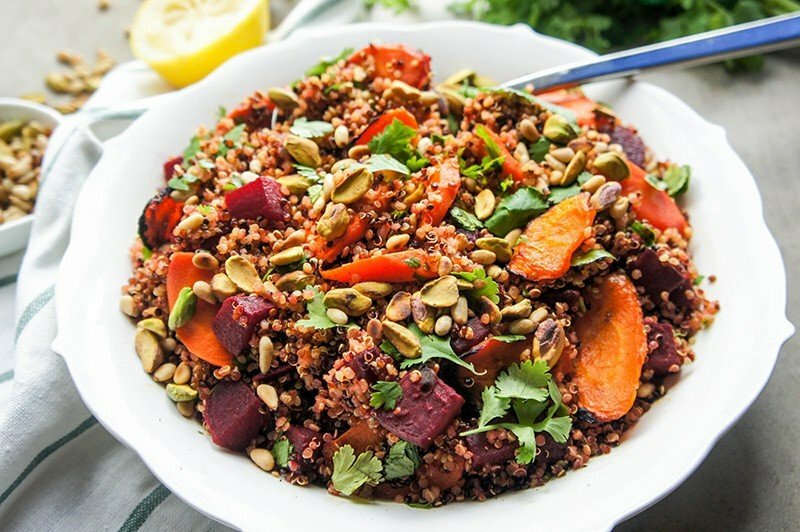 Once veggies and quinoa are cooked and have begun to cool (but are still warm), add to a serving dish or bowl. Mix in the cilantro, and drizzle the dressing over the top. Garnish with toasted nuts right before serving. You always make the most delicious salads! Seriously I started a salad board just so I could pin your salad recipes. Loving the spices, the nuts the grains and I know I am the odd one here but the beets. Yum! How is the little man doing? Wishing you a super weekend! Pinning, sharing and smoke signals sent. So nutty and delicious! YUM!!! This is such a perfect meal! First off, wow this salad looks wonderful! The colors and flavor combinations are amazing! Pinning for sure! Also, I think that is so cool/ that you are currently living in Kuala Lumpur! I was very intrigued while reading this post! I hope you are enjoying it there. Not many people can say they have experienced living in another country! Hi Erin, It looks like you're in the UK? My husband is English, but his family now lives in Australia, so I have yet to go to the UK. We are looking at moving to Spain or Portugal in a few years, so maybe not too long off. Right now I spend all my vacation time going to the States! I am looking forward to checking out your blog. Roasted beets are like magic- I swear very few vegetables taste that amazing roasted! chucked into a salad like this, I could faceplant it! 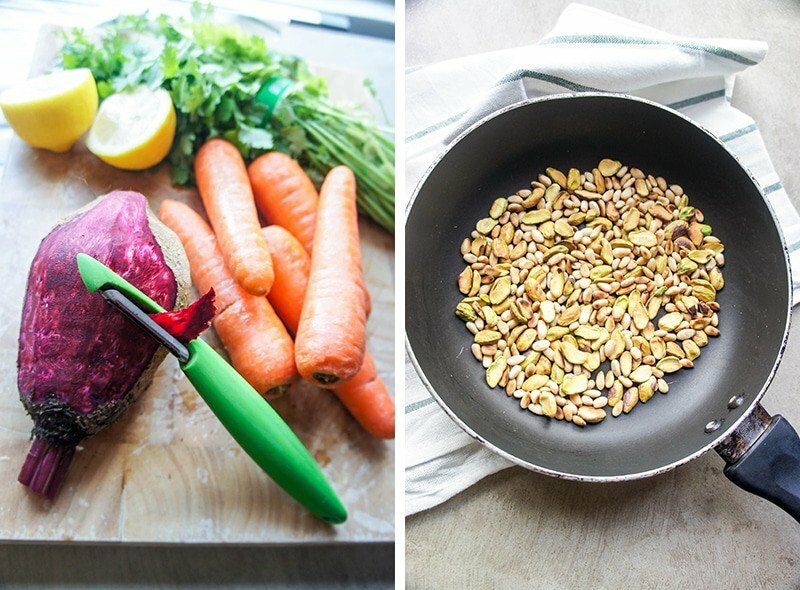 They are magic :) Both carrots and beets are just that much better roasted! Food photography is not as "easy" as it looks! It's definitely an art, and takes study and practice. I feel mine has been stagnant-- I don't have a great space for it, and finding props is very difficult in Malaysia. And with a baby, I have less space than before, and less time to learn and grow! Glad to hear you are enjoying it now-- it is a lot of fun if you have time to play with it and be patient. I love Victoria :) I haven't been in years. I won't be traveling far this summer though! It's going to be hard enough just make it to America with a 9 month old... who is already trying to get up and walk. Boy, will that be fun on a 30 hour plane trip! YES! This salad looks and sounds amazing. The combination of textures and colors are making my tummy rumble. Thanks Megan! It's a great one. My sister in law made a similar one while I was visiting at Christmas and I couldn't wait to recreate it when I got home! Addicting flavors and crunch!